A middle-income democracy of 2.8 million, with over 1 million living overseas, Albania is a member of NATO, an EU Candidate Member State and a member of the Human Rights Council since 2014. In recent years the government has embarked on reforms to improve legal, policy and institutional gender equality mechanisms. The new National Strategy for Gender Equality 2016-20 (NSGE) and Action Plan provide a strong gender equality vision, though financial and human resources to ensure the proper implementation are currently insufficient. Although weak, domestic violence prevention, protection, prosecution and referral mechanisms are a high government priority and improving. Remittances from Albanians overseas have helped keep down unemployment, which stands at over 18 per cent. An estimated 53.7 per cent of the population is urban, and on-going rapid urban migration has brought informal housing, infrastructure and social service challenges. Women in Albania continue to face daunting challenges. Women’s participation in political and economic decision-making remains limited, but has progressed recently with improvements in electoral codes and processes. By January 2017, women make up 23% of members of parliament, 35% of local counsellors, 9 in 61 mayors and 8 in 20 cabinet ministers. Violence against women is common, with almost 60 per cent of Albanian women aged 15-49 having experienced domestic violence. Little has been done to address the gender pay gap and improve women’s access to entrepreneurship services and credit. Women’s average salary is almost 18 per cent lower than men’s in urban areas and doubly lower in rural areas. Women are the majority of agriculture workers – but almost exclusively as unpaid family workers. Women’s labour market participation is increased to 51 per cent in 2014, but average salaries are 18 per cent lower those of men. Few women are in management. Active in Albania since it set up its Country Programme in 2007, UN Women works closely with the government and civil society to design and implement the laws, policies, programmes and services needed to improve the status of women and achieve global standards for gender equality. Within the One UN Programme in Albania, UN Women Albania leads on gender equality issues, and provides coordination and support to related activities. This public perception survey produced comprehensive and reliable data to assess women’s current participation in Albania’s politics and decision-making that could be used to inform future measures. A significant majority of interviewees said that women were under-represented in politics and decisions-making because of a political environment dominated by aggressive men. See more publications from Albania here. See more news from Albania here. 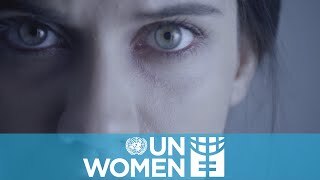 Watch this powerful 45-second video from UN Women Albania’s campaign on ending human trafficking. UN Women has helped boost national capacities to address the needs of women and girl survivors of trafficking, and reintegrate them into society.